Don't leave yourself without a place to set your rocks glass while you're grilling! 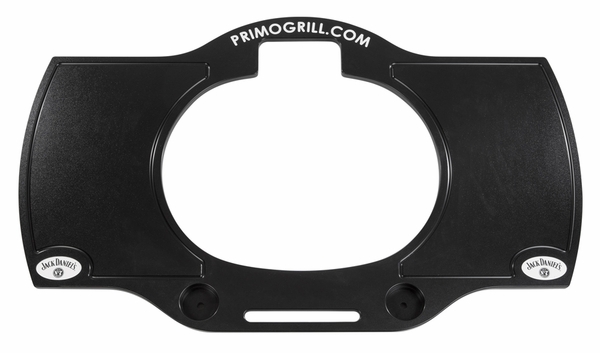 Made of marine-grade HDPE, and built to fit the Jack Daniels' edition Primo Oval 400, this One Piece Island Top has two cup holders built in - perfect for making sure you don't confuse your Jack Daniel's drink with your homemade Jack Daniel's Barbeque sauce. Don't worry about leaving it on your deck, either - the HDPE is made with UV inhibitors to keep it looking every bit as sharp as it did the day you bought it! WARNING: Burning charcoal in this product can expose you to checmicals including carbon monoxide which is know by the State of California to cause birth defects or reproductive harm. For more information go to www.P65Warnings.ca.gov.